Nuts to that! Any kind of break is useful for one thing and one thing alone - a massive road trip, and where better to do that than the USA! 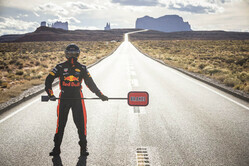 Daniel Ricciardo takes the RB7 on the ultimate road trip from San Francisco to Monument Valley before taking a small detour south, to Sin City itself, Las Vegas. From the Golden Gate Bridge to the Strip enjoy this awesome slice of Americana.